If you’ve been looking for a new way to get around Downtown Cincinnati, then your wait is finally over. On September 15th a new bike-sharing service opened up at 30 different locations. What is bike-sharing exactly? Well in Cincinnati it works like this: You buy a pass (either for a day, or for a year), you go to one of 30 different bike locations and “check out” a bike. From there you’re on the clock. If you return it within the next 60 minutes (again to any one of the 30 locations) you’re good to go. You can do this as many times as you want in the day, or through the year if you bought a yearly pass. The only catch is that you’re charge additional fees if you don’t return a bike before the 60 minute timer is up. So if you’re looking for a leisurely bike ride around town, this is probably not for you. But if you’re wanting to get across downtown without much hassle, the expense of a cab, or simply to see the town from a new angle, this might be a win. While the bike-sharing program is probably not for everyone, it does offer two advantages. It’s good exercise, and provides a more scenic view of downtown than you might otherwise get. Something that we might need after we’ve eaten from all those great local donut shops! But in my mind, the best benefit is that it gives you one more reason to head downtown. 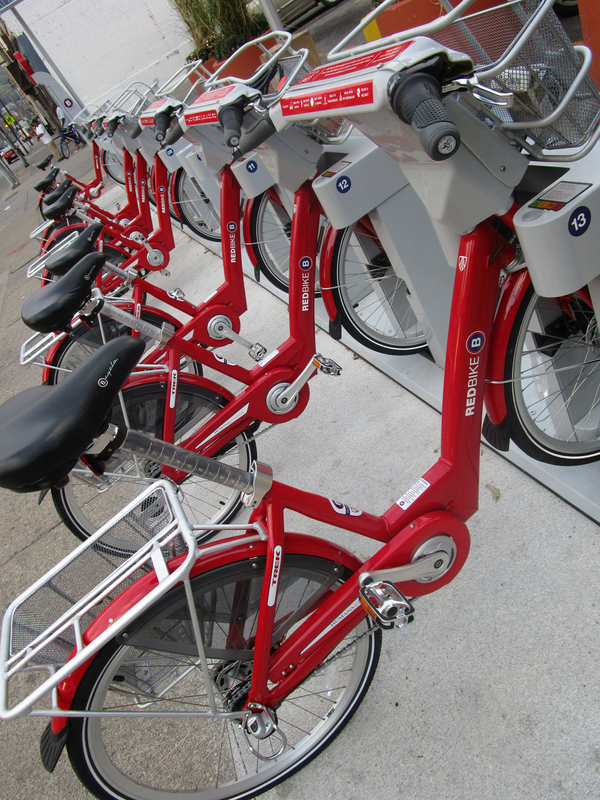 This entry was posted in Communities and tagged Cincinnati bike sharing, red bikes by Eric Barrett. Bookmark the permalink.